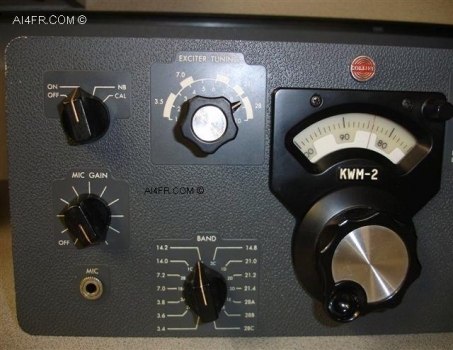 The Collins KWM-2 is a transceiver that covers all of the amateur bands between 3.4 mc and 30 mc with a power input of 175 watts PEP on SSB or 160 watts on CW. It has a nominal output power of 100 watts into a 50 Ohm load. 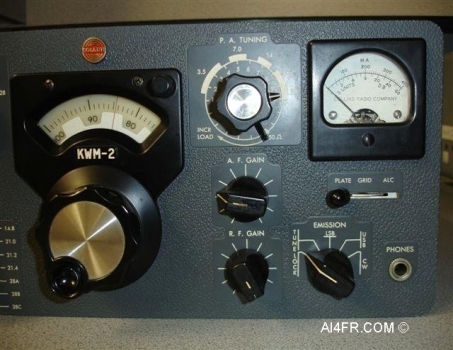 The KWM-2 has a duty cycle of 100% for SSB and 50% for CW. 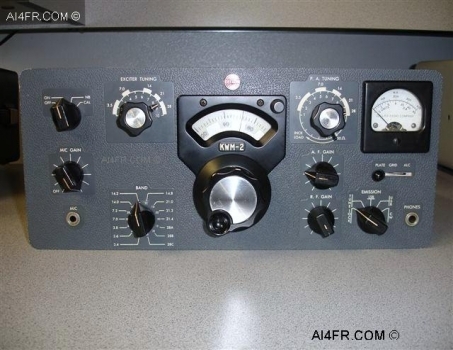 The KWM-2 consists of a double conversion receiver and a double conversion transmitter. The transmitter and receiver circuits use the same common oscillators, mechanical filter, and RF amplifier. The transmitter low frequency IF and the receiver low frequency IF is 455 kc. The high frequency IF for both is 2.955 to 3.155 mc. This is a band pass IF which accommodates the full 200kc bandwidth. The KWM-2 can be operated on any frequency in the range of 3.4 to 30 mc, except 5 to 6.5 mc, by installing the appropriate crystals. The KWM-2 comes equipped with crystal sockets, crystals and bandswitch positions for eleven 200 kc bands. 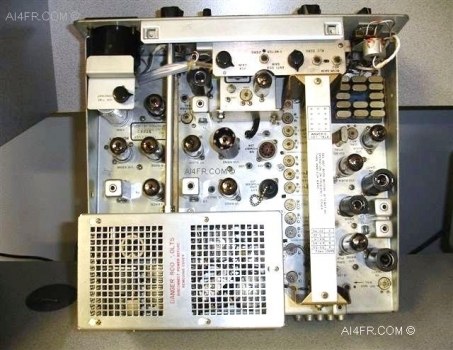 Crystal sockets and bandswitch position also are provided for two additional 200 kc bands between 28 mc and 30 mc. The front panel controls are as follows, an OFF/ON/NB/CAL SWITCH, EXCITER TUNING, ZERO SET, PA TUNING, LOADING, MIC GAIN, BAND SWITCH, AF GAIN, RF GAIN, EMISSION and METER SWITCH. The size of the KWM-2 is 14-3/4" wide by 7-3/4" high by 14" deep. 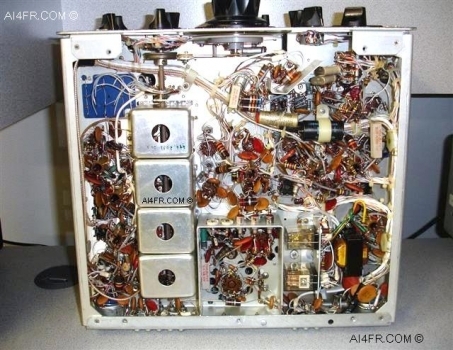 This transceiver weighs in at 18 Lbs. 3 oz. 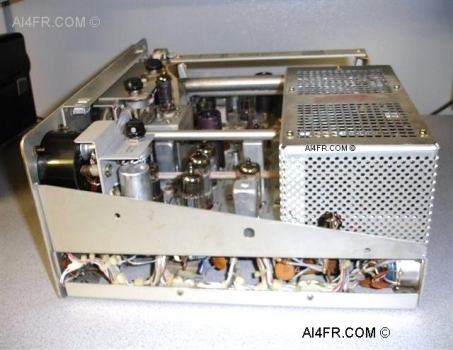 The Collins power supply for this transmitter is the 516F-2. These next two pictures are a close up of the front face plate and associated hardware. When one talks about Collins gear a certain phrase may go some thing like this "I picked up a winged emblem Collins today". What the speaker is referring to is the Collins logo emblem. Notice how the red emblem above the dial in the example above is round. For a look at a winged emblem Collins logo please click HERE . At other times one may be researching Collins gear and see phrases such as WE or RE used to describe the equipment. Now you will know what the author is referring to, WE would mean Winged Emblem while RE stands for Round Emblem. Now why is all this important to you? Often there is quite a considerable price difference between the WE and RE gear. The RE gear seems to bring with it a higher price tag. The reason for this higher price from what I have researched, is that Collins made more of the WE models then RE. 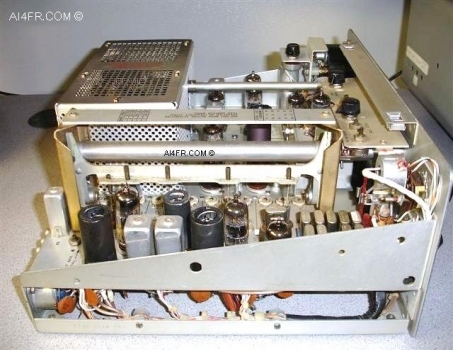 These next two photographs are of both the left and right sides of the KWM-2 transceiver with the case removed. 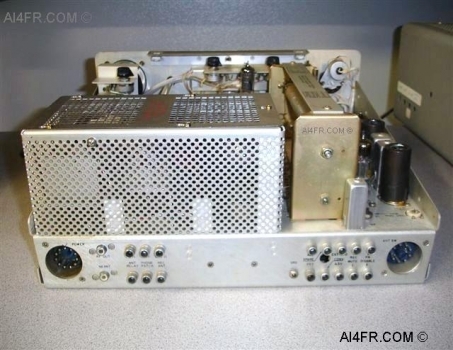 These next two photographs show the KWM-2 transceiver with the case removed. Here we can see the tube compliment in the picture on the left and in the right picture we see the components that are located under the chassis.